By definition, business ethics are the moral principles that act as guidelines for the way a business conducts itself and its transactionsTransactionsDownload free transaction templates including a Letter of Intent (LOI), Term Sheet, Non-Disclosure Agreement (NDA), Confidential Information Memorandum (CIM), Equity Capital Markets (ECM) memo, Due Diligence checklist, and other types of corporate transactions. Download the Word Document files for your own use. In many ways, the same guidelines that individuals use to conduct themselves in an acceptable way – in personal and professional settings – apply to businesses as well. Acting ethically ultimately means determining what is “right” and what is “wrong.” Basic standards exist around the world that dictate what is wrong or unethical in terms of business practices. For example, unsafe working conditions are generally considered unethical because they put workers in danger. It might look like a crowded work floor with only one means of exit. In the event of an emergency – such as a fire – workers could become trapped or might be trampled on as everyone heads for the only means of escape. While some unethical business practices are obvious or true for companies around the world, they do still occur. In other instances, determining what practices are ethical or not is more difficult to determine if they exist in a grey area where the lines between ethical and unethical can become blurred. For example, assume Company A works with a contact at Company B, an individual through which they negotiate all the prices for supplies they buy from Company B. Company A naturally wants to get the best prices on the supplies. When the individual from Company B comes to their home office to negotiate a new contract, they put him up in a top-tier hotel, in the very best suite, and make sure that all his wants and needs are met while he’s there. In technical terms, the practice is not illegal; however, it might be considered a grey area – close to, but not quite, bribery – because the individual is then likely to be more inclined to give Company A a price break at the expense of getting the best deal for his own company. To truly break down business ethics, it’s important to understand the three basic components that the term can be dissected into. The first part is the history. While the idea of business ethics came into existence along with the creation of the first companiesCorporationWhat is a corporation? A corporation is a legal entity created by individuals, stockholders, or shareholders, with the purpose of operating for profit. The creation involves a legal process called incorporation where legal documents containing the primary purpose of the business, name, and location or organizations, what is most often referred to by the term is its recent history since the early 1970s. It was when the term became commonly used in the United States. 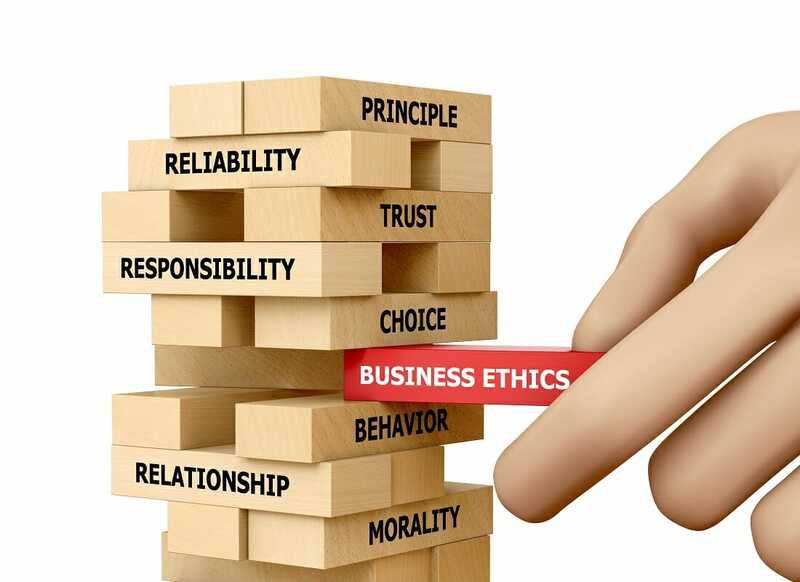 The main principles of business ethics are based in academia and academic writings on proper business operations gleaned through research and practical study of how businesses function and how they operate independently and with one another. The second major meaning behind the term is derived from its close relationship and usage when scandalsTop Accounting ScandalsThe last two decades saw some of the worst accounting scandals in history. Billions of dollars were lost as a result of these financial disasters. In this article, we look at the 10 biggest accounting scandals in recent times. Many of these scandals were a result of the excessive greed of the occur. Companies selling goods in the U.S. that were created using child labor or poor working conditions is one such scandalous occurrence. Perhaps, the most recent and continually developing aspect behind business ethics is the third piece – the idea that companies are building business ethics into the core of their companies, making them the main standard and part of their operational blueprintCorporate StrategyCorporate Strategy focuses on how to manage resources, risk and return across a firm, as opposed to looking at competitive advantages in business strategy. As the world continues to grow more political – and more politically correct – the increased focus on proper business ethics and strong adherence to them becomes ever more the norm. Business ethics are important for every company. They keep workers safe, help trade and interactions between companies remain honest and fair, and generally make for better goods and services. Distinguishing what a company will and won’t stand for is not always the same for each organization, but knowing what guidelines needs to be followed help keep a company honest and productive.